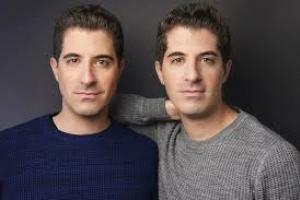 WILL & ANTHONY NUNZIATA - FROM BROADWAY TO ITALY! After a stunning performance in 2018 we received a huge number of email and phone call requests to have Will & Anthony back in 2019 with a new show. The great news is that Italian America’s favorite singing twins will headline our September Supper Club evening performing a night of their favorite Italian and American songs! It will be an all Italian night with Mansion Chef Rick Bieber creating an Italian feast to get us all in the mood for the evening’s performance. The brothers bring their signature two-part harmonies, soaring tenor voices and comic wit to fresh takes on the greatest songs ever written for the stage and the greatest songs ever performed by famed Italian-American singers like Frank Sinatra, Tony Bennett, Frankie Valli and Dean Martin, and many more! The renowned singers, songwriters, Netflix-bound comedians and Carnegie Hall Headliners are the Brooklyn- born, classically trained singing and comedy brother duo hailed by The Huffington Post as “a nearly impossible pairing of talent, stage presence, and charisma.” They recently headlined Carnegie Hall for two sold-out concerts with the New York Pops Symphony Orchestra. They have brought their distinct take on classic & contemporary songs as well as their movie-bound original tunes to performing arts centers and theaters, as well as intimate jazz clubs and symphony concerts with orchestras such as the New York Pops, Detroit Symphony, Cleveland Pops, Colorado Symphony, Lancaster Symphony, Annapolis Symphony, Cape Cod Symphony, Toledo Symphony, and Edmonton Symphony Orchestra. Don’t miss this fun night.